The H.T. Hackney Company employees and The Sansom Family will develop a downtown sports complex to serve thousands of inner city young people and bring investment to the City of Knoxville’s Downtown North Redevelopment area. 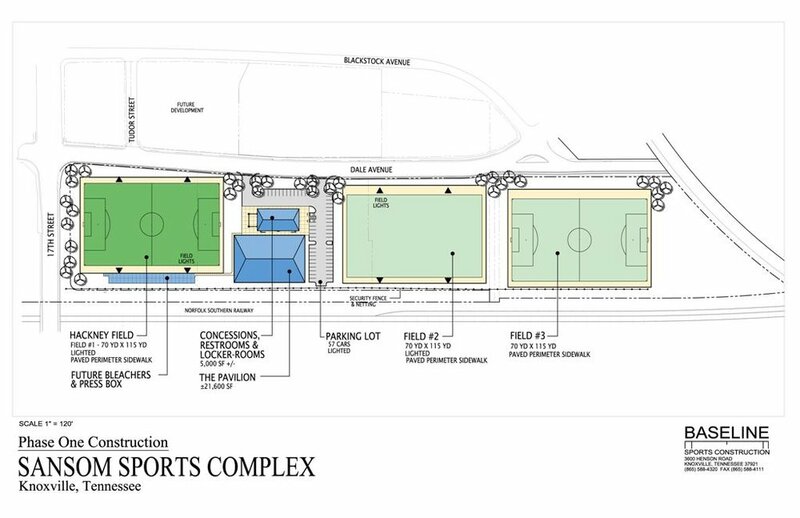 Emerald Youth Foundation will oversee and operate the sports complex, to be on a 14-acre parcel of property near World’s Fair Park, once occupied by an H.T. Hackney warehouse. Sansom is CEO of Knoxville-based H.T. Hackney, one of the largest wholesale grocery distributors in the U.S. The Sansom Sports Complex will provide world-class playing fields and facilities for soccer, lacrosse, flag football and performance training. Primary users will be the children and teens who attend Knoxville’s urban schools, said Steve Diggs, executive director of Emerald Youth. The project will transform a vacant industrial site bordered by Dale Avenue on the north, the Norfolk Southern Railway tracks on the south, Seventeenth Street on the west, and the Western Avenue viaduct on the east. Located near the junction of I-40 and I-275 downtown, the land is centrally located, level and nearly ideal for playing fields. “The Sansom Sports Complex is a welcomed addition to our city. It will provide additional playing fields where our youth can be active and will help revitalize the area. Bill Sansom and the Sansom Family have opened their hearts to our community in a way that will greatly benefit the lives of our boys and girls,” Knoxville Mayor Madeline Rogero said. The first field, pavilion and field house should open by spring 2014, and the last two fields should be completed by summer 2015. When complete, the unique complex will include three synthetic turf fields, a pavilion covered turf field, and a 5,000 square foot field house with a performance-training center. Baseline Sports Construction of Knoxville is the builder. Diggs said three of the fields will be large enough for high school, collegiate and even professional soccer and, by using different color paint for the playing lines of different sports, they can be used for other sports. Sansom will pay for construction of the complex, and Emerald Youth will fund the yearly operating costs. Emerald Youth will hire a sports complex staff, to include a complex manager, director of soccer coaching, and sports performance trainer. Sansom said he is a longtime admirer of Emerald Youth’s mission of ministry through sports teams, which now include basketball, baseball, volleyball, swimming and soccer. “These programs are all part of a strategy to build wholesome young leaders in our communities while providing opportunities to participate in some non-traditional sports and have outlets for physical exercise,” Diggs said. Sansom said he hopes to correct a shortage of playing fields for urban youth. Emerald Youth has no playing fields of its own. Its fall soccer league drew 103 players, with the 12 teams playing on a single converted football field at Alice Bell Park. A preliminary study for use of the facility has outlined plans for a range of non-traditional sports, with soccer as the centerpiece. Plans include: recreational soccer for ages 5-adult; competitive soccer teams that could play local club teams; a winter futsal (indoor soccer) league for boys, girls and young adults; and helping establish boys’ and girls’ soccer teams at inner city middle schools and supporting inner city high school teams where desired. Emerald Youth also plans to start lacrosse teams and offer flag football for older youth. About 300 children and youth who receive after-school care through Emerald Youth would use the fields periodically, and Emerald Youth also looks to work with the international soccer community in urban Knoxville who need playing fields, Diggs said.